Dan is a long-standing baseball coach in Tucson and has led the Santa Rita high School program since 1979. In 1986, he guided the Eagles to the Class AAA state championship. He also had his team in the state playoffs every year from 1982 to 2003. Santa Rita was the state runner-up in Class 4A in 1999 and 2000 and won divisional championships in 1982, 1989, 1992 and 1997. In addition to coaching high school, Dan has led Connie Mack teams, winning two state championships and six Southern Arizona championships, as well as Big League teams, many of which won championships. 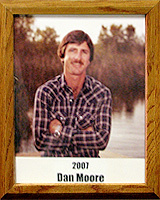 In 1982, Dan’s Big League team won Arizona, regional and national championships and he was named National Coach of the Year. Dan also has helped coach the football team at Santa Rita as junior varsity coach from 1979-84 and freshman coach from 1985-2004. He is and has been a member of the Arizona state Coaches Association, Arizona Baseball Coaches Association and Connie Mack Baseball. Dan played high school baseball and football at Manhattan (Kansas) High School and Sahuaro High School, from which he graduated in 1972. He played free safety in football and the infield, outfield and catcher in baseball. Later he was on the baseball teams at the University of Mexico and New Mexico Highlands University.